Textkernel is happy to announce the newest release of Search! and Match!, its products in the field of semantic searching and matching. Besides general performance improvements, a major new feature has been added: field-in-field search. Field-in-field search (also called ‘nested field search’) offers the possibility to do more complex queries such as the level of a certain skill or multiple availabilities of candidates. How does the field-in-field search improve your sourcing efforts? With Textkernel’s field-in-field search, you are able to search in multiple levels within a search field. 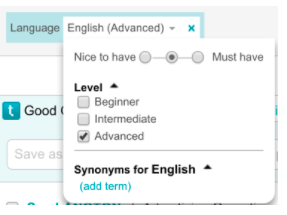 For instance, you can look for candidates who speak English and then refine your search to find candidates whose level is advanced. Especially customers with large databases require more complex search functionalities within certain fields. To accommodate this request we implemented this new feature. How can you use field-in-field search? You can find further information regarding the field-in-field search in Textkernel’s blog. If you have any further questions regarding this new release, do not hesitate to contact us.